Apartment Marinheiro is a perfect apartment for a nice central base in the old fishing town of Olhao. 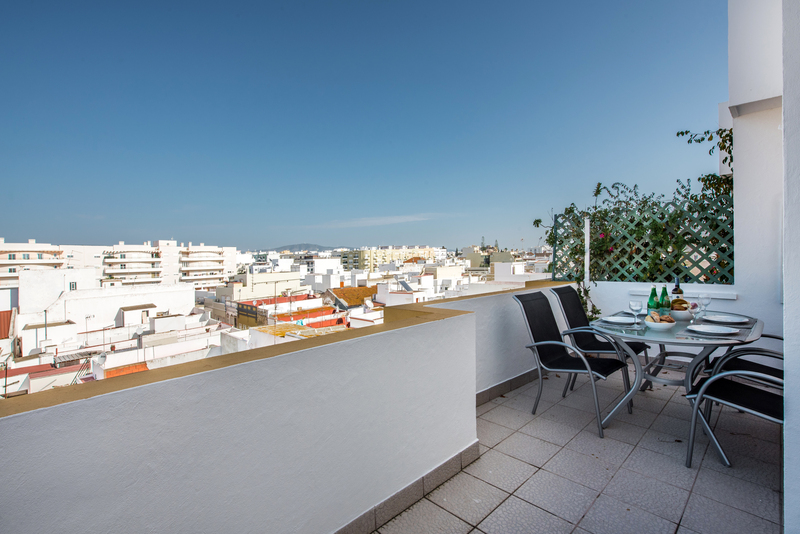 The 2 bedroom apartment is situated within a block of apartments right in the heart of old Olhao. 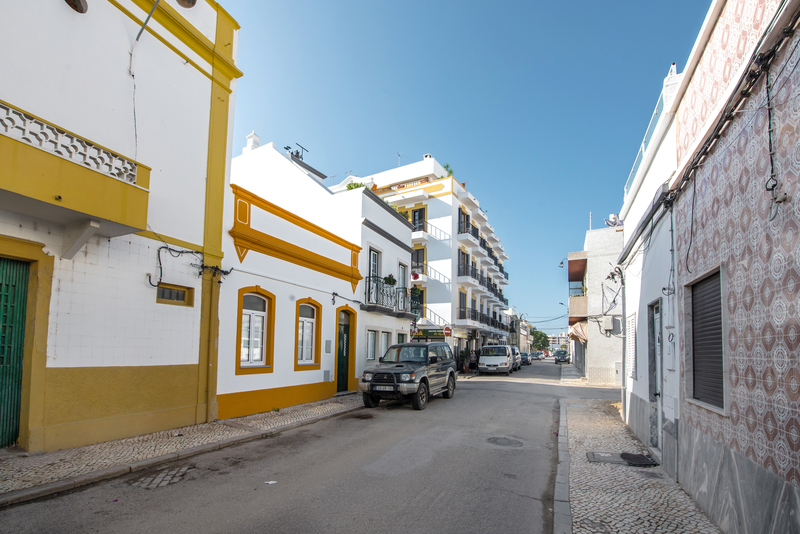 Apartment Marinheiro, our wonderful 2 bedroom apartment is accessed via a secure intercom system from the small side street road the apartment block is nestled in. There is the option of stairs or a small lift to the apartment which is situated at the 4th floor level. A solid wooden door opens out straight into the 2 bedroom apartment space. 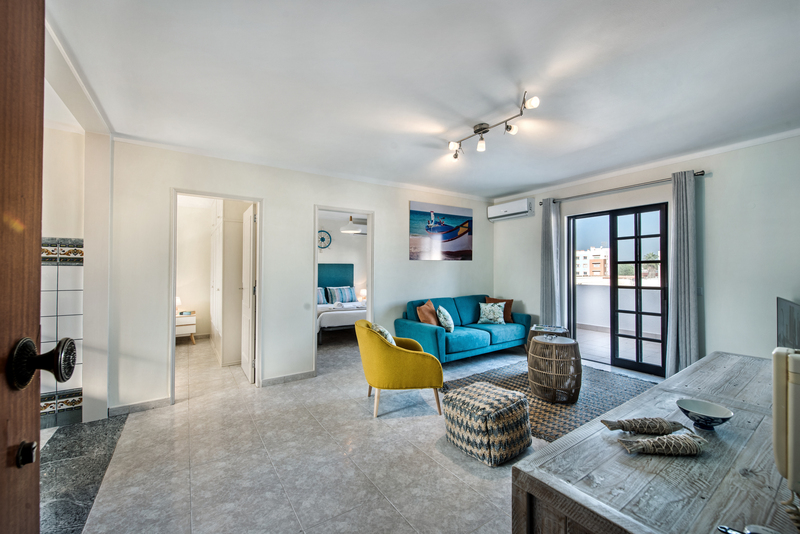 Our wonderful 2 bedroom apartment has been renovated to bring it up to and beyond the standard expected for our holiday property portfolio. The main front door opens up in to a now light and spacious living area. A beautifully styled sofa and armchair surround a set of coffee tables and against the wall is a stylish television unit with a matching cupboard unit styled in a distressed wood beach theme. A large flat screen television sits on the tv unit and offers a selection of European channels. The apartment has excellent WIFI too. 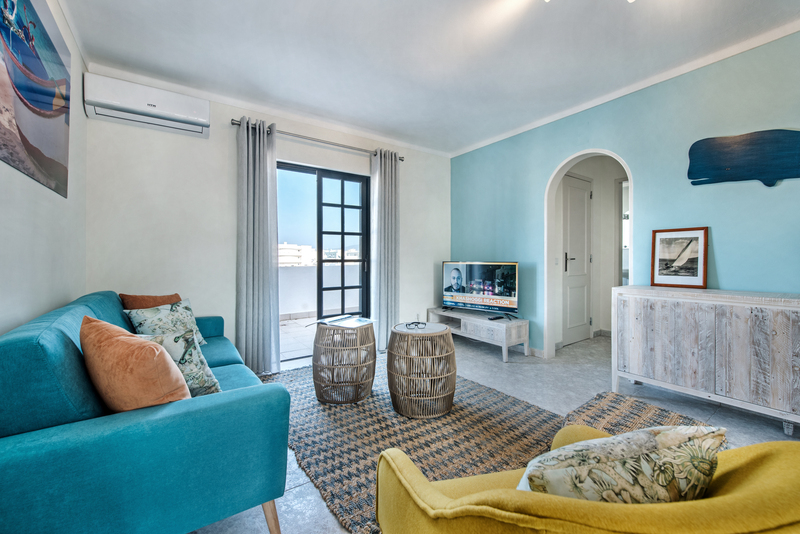 The living room offers up to date comfortable living with clean tiled floors, cream walls decorated with beach and sea theme pictures. An archway from the living room leads to the bathroom and large french sliding windows open to the a huge terrace. To the left of the open plan living space is a large kitchen and dining area. 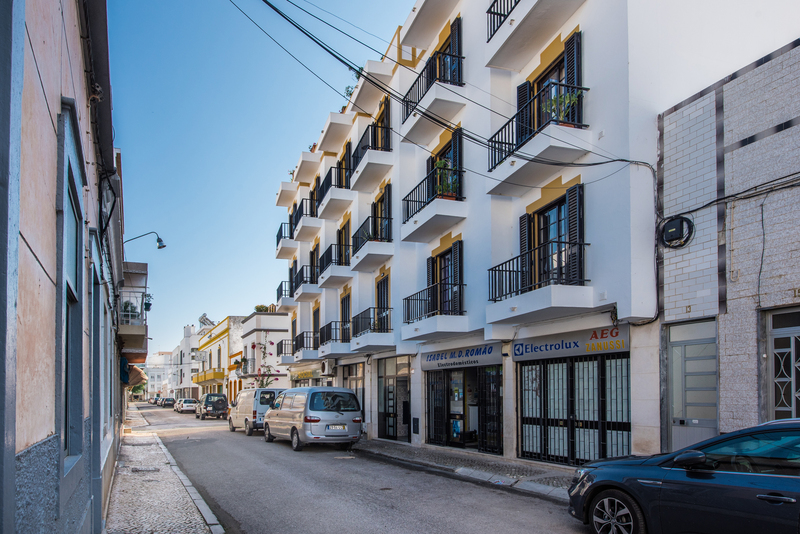 Totally refurbished in 2018 the walls have been tiled in very traditional Portuguese wall tiles and a whole brand new kitchen has been fitted with very smart modern blue units in keeping with a sea colour theme but with a very modern twist. A smart white table and chairs are placed in the kitchen area, giving a great place to eat all the wonderful fresh produce Olhao Daily Market has to offer. 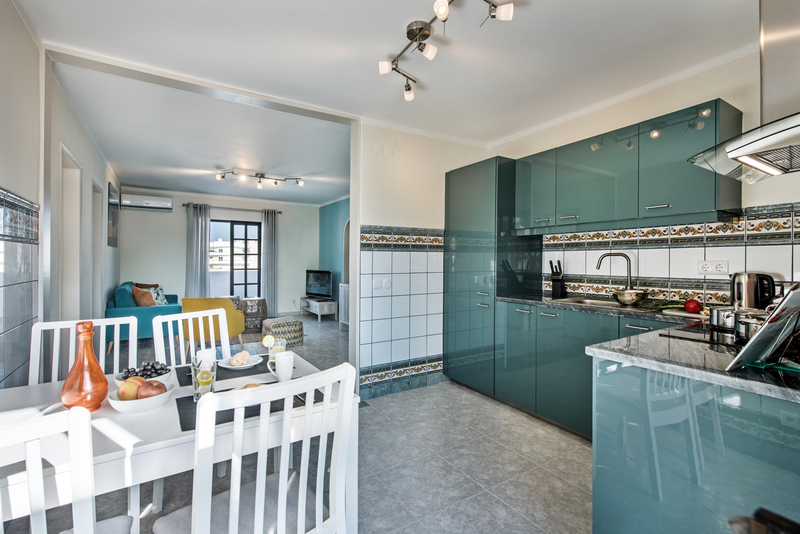 The kitchen is very well equipped with a large fridge freezer, oven hob and extractor, washing machine, microwave, kettle, coffee machine and toaster. In the plentiful drawers you will find an excellent selection of cooking utensils including plenty of pots and pans, spoons spatulas, fish slices and much more. The 2 bedroom apartment kitchen is stocked well with cups, plates, mugs, glasses crockery and cutlery for your use. To the rear of the open plan kitchen and diner is another set of French sliding windows offering access to a small terrace that in tune can give access to the Master bedroom. This terrace overlooks the central part of the apartment block. The French windows are instrumental in adding that extra slice of natural slight to the apartment too. Both bedrooms are accessed from the living space. 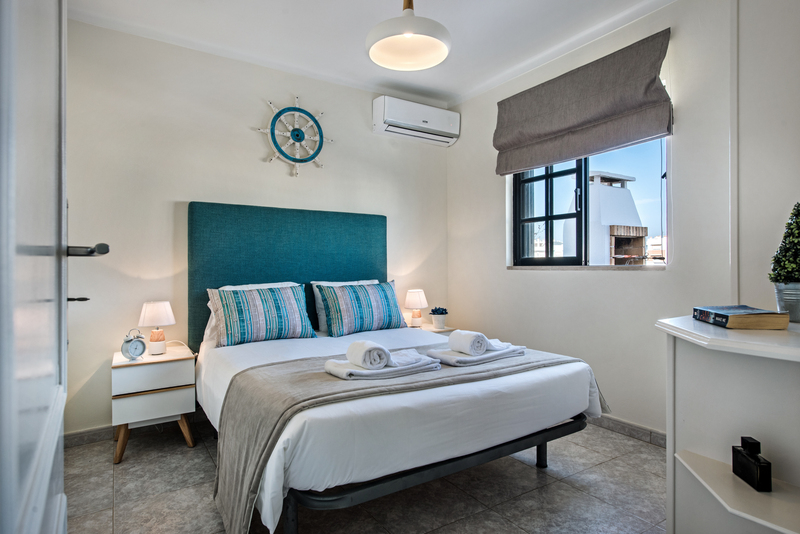 The first bedroom is lightly decorated with light tiled flooring, cream walls and two single beds with a large sandy coloured fabric headboard with fabulous scatter cushions and lovely wall designs to keep with that seaside theme. Each side of the beds are neat white and light wood bedside units with matching lamps and also in the bedroom. 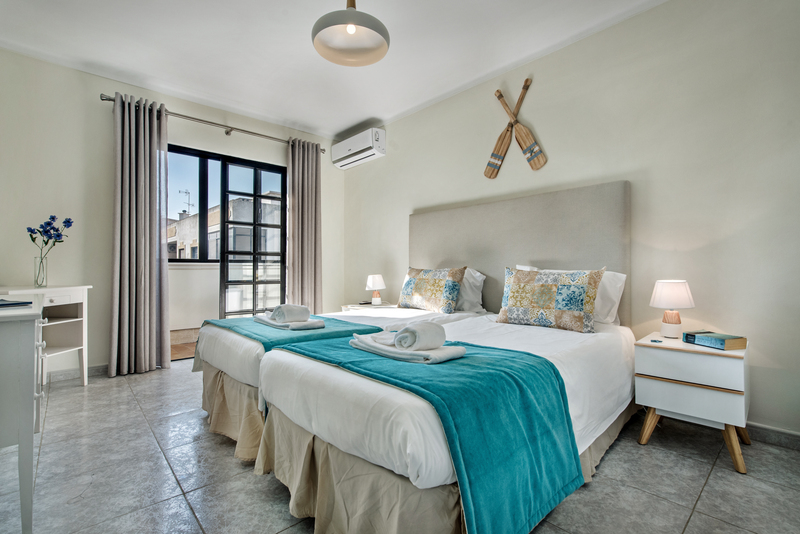 An air conditioning unit has been installed inthe bedroom, fabulous to keep cool in the summer and the option to add heat on those sometimes cooler winter nights here in the Algarve. Sliding French windows lead out on to a nice little terrace that overlooks the centre of the apartment complex and also give access to the kitchen/diner. Bedroom two offers a large double bed and fabric head board in a teal blue theme again with matching scatter cushions and a beautiful seaside effect. Bedroom 2 also offers plenty of light and style along with air conditioning to keep cool in those lovely warm balmy summer nights but also warm and cosy for a winter trip. A window looks out onto the front large terrace situated at the front of the 2 bedroom apartment. This 2 bedroom apartment offers one bathroom. It is situated via an archway from the main living space. 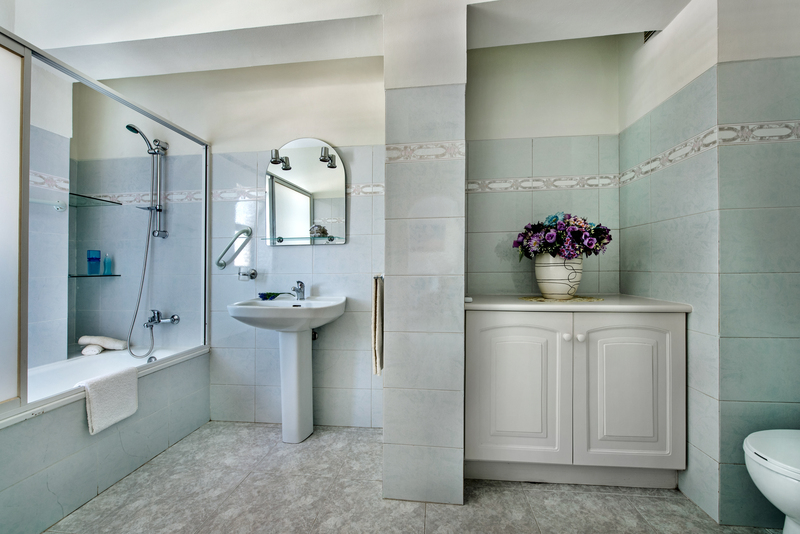 The bathroom is a good spacious room with a full size bath and over head shower, basin set into a vanity unit with plenty of space to store cosmetics and toiletries below. A large mirror hangs over the basin and vanity unit. Then the bathroom also offers a toilet and bidet. 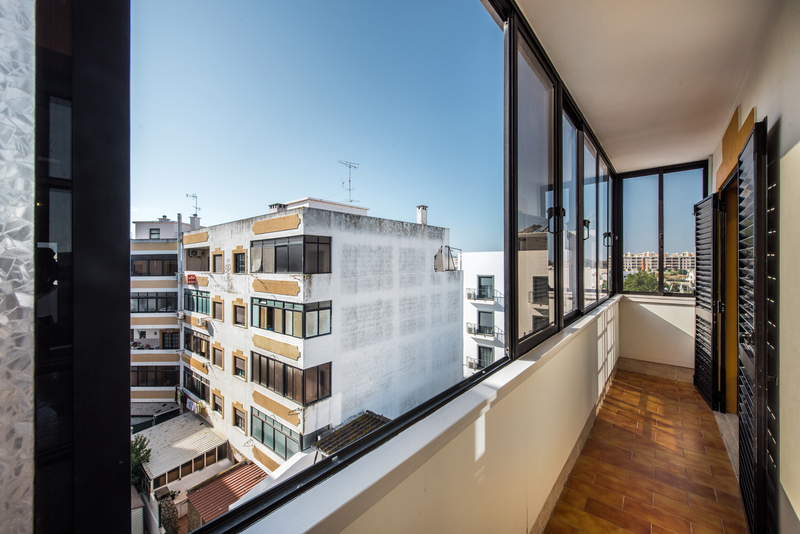 To the rear of the 2 bedroom apartment is a terrace that runs the length of the apartment and overlooks the centre of the apartment complex. 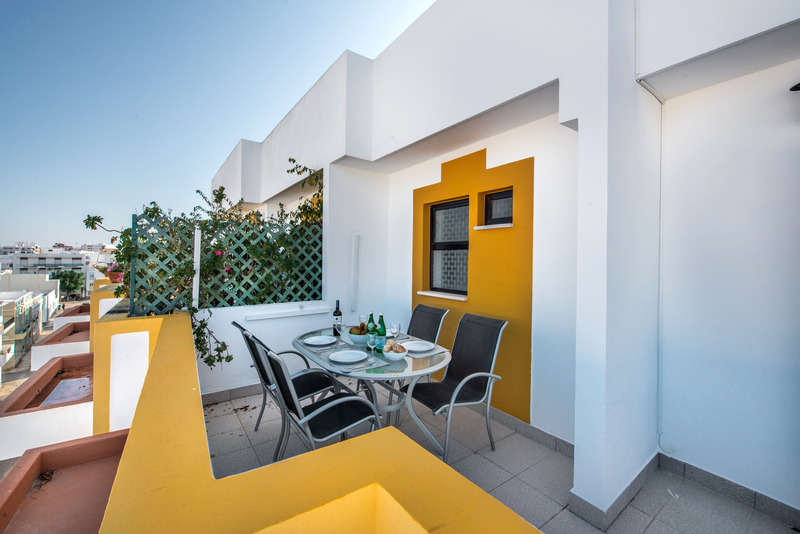 This terrace would be great for a place to sit and enjoy breakfast watching the lovely Algarve sunrises. To the front of the apartment and accessed via sliding French windows from the open plan living space is a large private terrace offering a fantastic outside space. 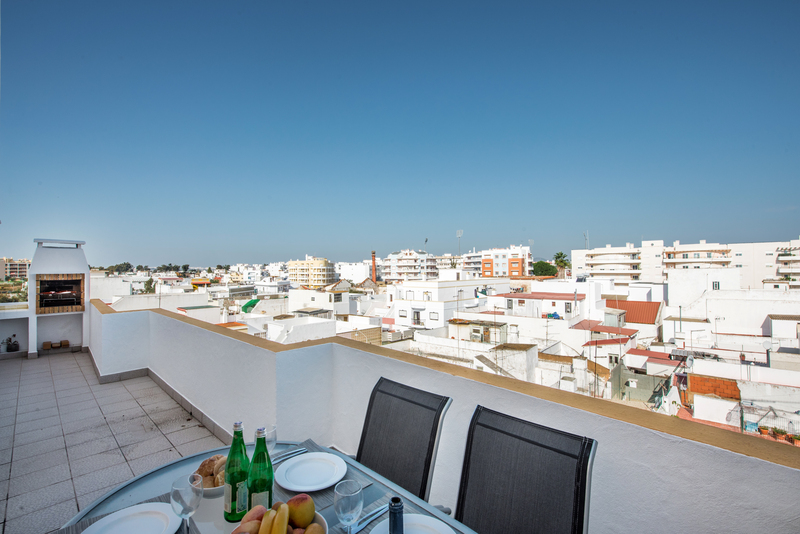 This terrace really makes the apartment stand above many others in that it is an amazing size. 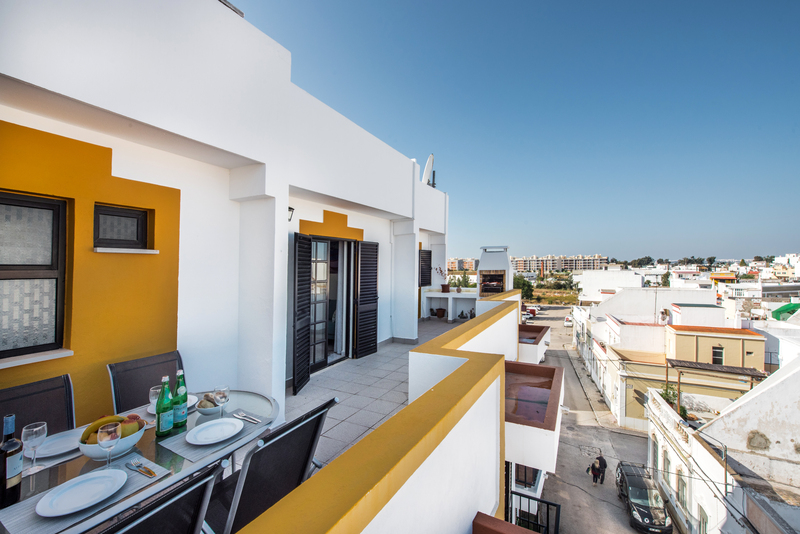 It offers exceptional views over the old and magnificent fishing town of Olhao with all its picturesque cubist rooftops. Situated to get the best from the evening sun it makes for a perfect place to watch the summer sun wane with a glass of something nice before dinner. 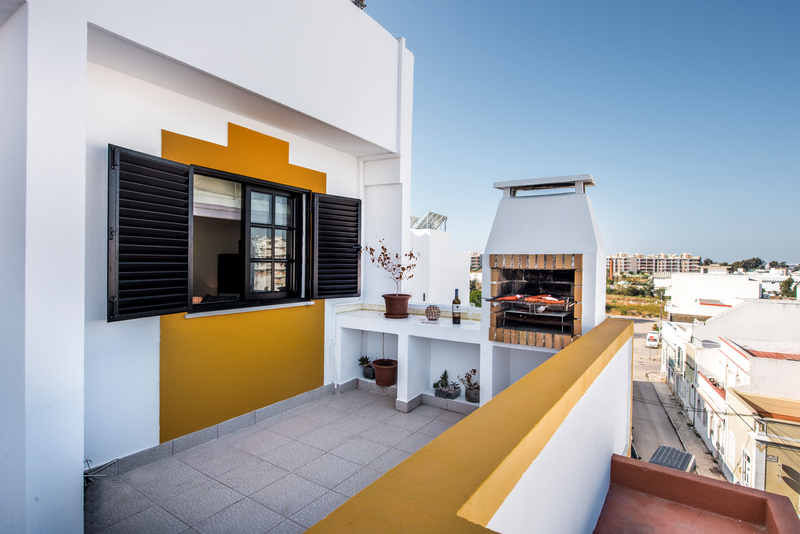 This terrace has the amazing added extra of a proper and traditional Portuguese bbq. So just a heavenly place to sit, relax and cook some bbq food on the best style bbq there is! The terrace offers and outside table and chairs too. 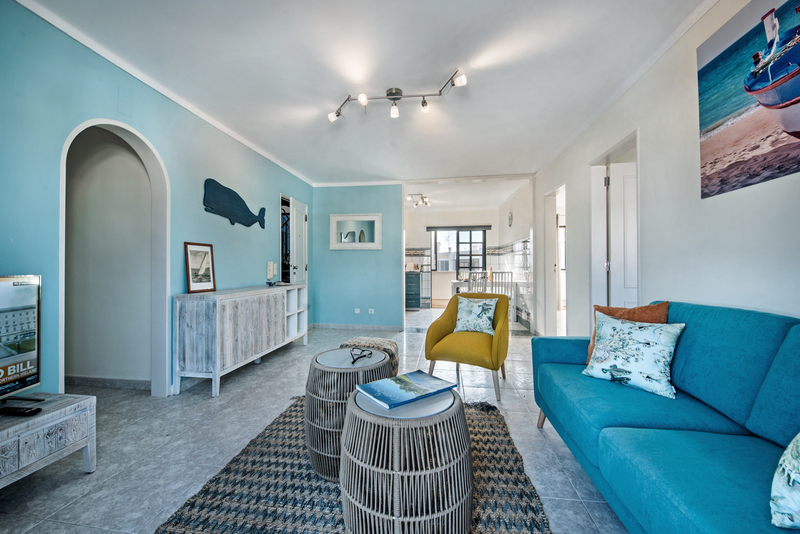 Apartment Marinheiro (Fisherman in Portguese) has been renovated and styled to totally fit with the seafaring way of life that Olhao is so famous for. Situated right in the heart of the town everything you could need is very easily accessible. This makes a great spot if you don't want to hire a car as both the train and bus station are in easy reach of the apartments by meandering along a couple of the small streets. Positioned just a very short walk from the seafront the 2 bedroom apartment works well for walks along the promenade, gardens and marina offering a chance to enjoy to eclectic mix of sailing boats and old fishing boats. From here and just outside the Real Marina Hotel you can catch the ferries or flotilla of private taxis to the islands of Olhao where you will simply find the best beaches around. From here you can also catch some amazing boat trips to dee dolphins or enjoy the stunning sea-life the Ria Formosa has to offer. Our lovely 2 bedroom apartment comes with its own manual that you can download to your tablet or smart phone. Packed full of information to make the best of your holiday starting from the moment you arrive. It tells you how to collect the keys, who will look after you during your stay and clear concise directions to Apartment Marinheiro. Then it is packed full with details of the best restaurants, taxis and local amenities and activities. We had a wonderful stay in Olhao. "We had a wonderful stay in Olhao. The Mars Algarve team were very prompt, pleasant and informative. They also helped us organise our airport transfer from Faro and back. 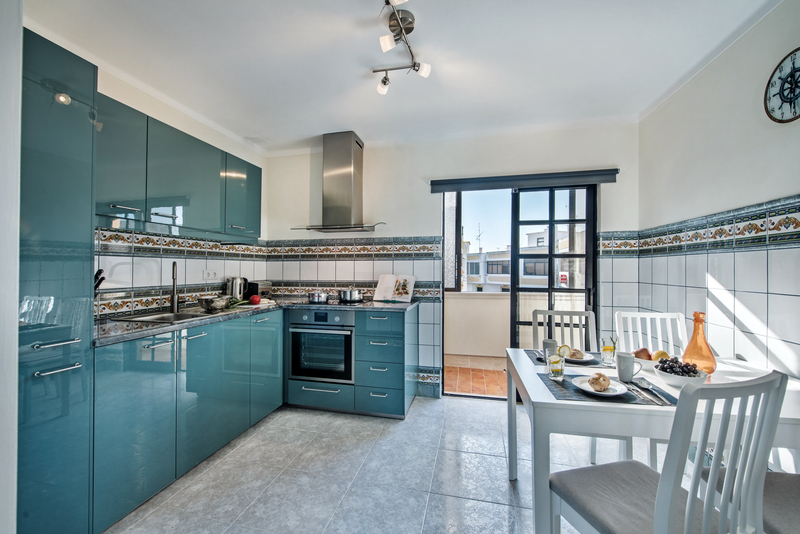 The apartment is very nicely decorated, great location, less than 10 minutes walk from the main bars and restaurants. We loved our first visit to Portugal and would recommend staying in any of the Mars Algarve apartments." "Exactly how it appears online, very clean and great communication! Location was great only few minutes walk from great restaurants and train station! Beautiful quiet location and loved the balcony for sitting out and eating in the sun for the evening. Would recommend staying!" "Thanks for allowing us to have the late checkout, much appreciated. Would recommend to a friend." "Brilliant find! Only a 10 minute train ride from Faro but Olhao itself is quaint and great to explore. 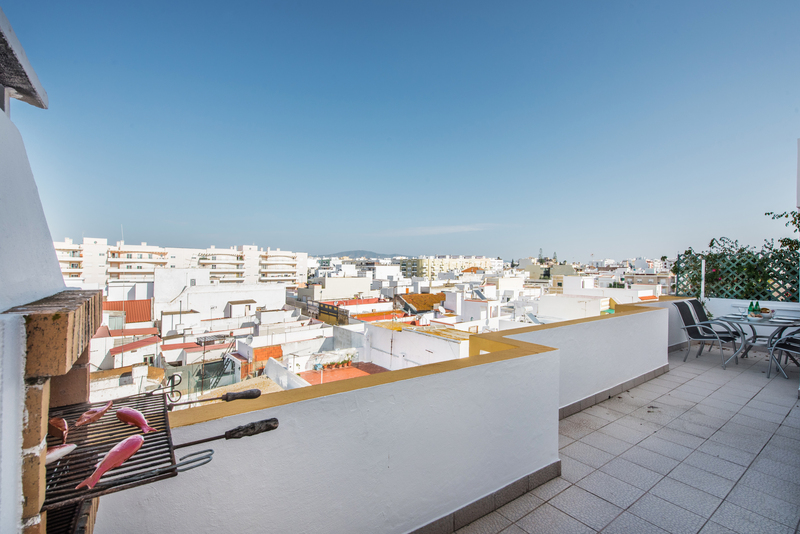 The apartment is very stylish and comes with everything you could need as well as a fabulous terrace - definitely a selling point for those sunny mornings! Would recommend 100% - they sorted out our taxi transfers and we were met and shown round our apartment as soon as we got there. Great hospitality." "Thanks so much for having us, we had a great stay and will definitely look into using Mars Algarve if we find ourselves in the Algarve again!" Olhao is a perfect destination to stay in if you want some serious down time and relaxation away from the more bustling Faro. We found it very easy to navigate our way to Faro and Olhao itself is quaint, full of lovely dining options and peaceful in its own right. 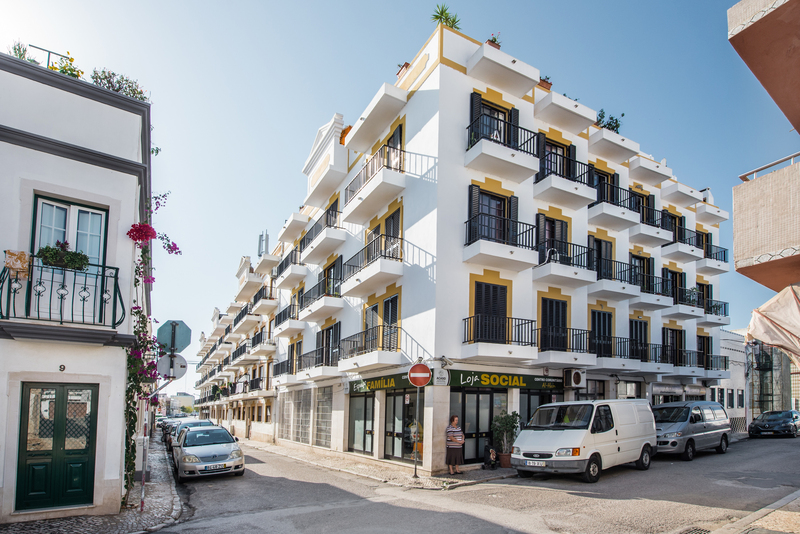 The accomodation itself is a perfect base and also ideally located near the station, supermarkets and allows you to explore Olhao's intricate side streets. Thanks so much - our stay has been wonderful. "Die Unterkunft entspricht genau den Bildern und liegt inmitten von Olhão. Mir persönlich hat das Design sehr gut gefallen. Es ist angelehnt an das Thema Fischerdorf, wofür Olhão ja bekannt ist. Zum Hafen sind es zu Fuß nur wenige Minuten und auf der Straße haben wir auch immer einen Parkplatz gefunden. Es gibt in jedem Raum eine Klimaanlage und auch die Küche ist gut ausgestattet mit Töpfen, Tellern und alles was man so braucht. Nur Gewürze, Waschmittel und Ähnliches gab es nicht. Der Gastgeber hat immer sehr schnell auf meine Fragen geantwortet und uns jederzeit weiter geholfen. Die Wohnung war sauber. Darüberhinaus ist Olhão wirklich ein hübsches Fleckchen und ein guter Ausgangspunkt für Ausflüge." The flat is bright and with an open space. It has a huge terrace, where is also grill. The area is quiet, so during the evening it is a pleasure to take a rest outside. In the kitchen is almost everything, what you need to cook and bake. It has around 1000 TV chanells in every language of the world. The Internet is very fast. There is place to sleep for 5 persons (one on the sofa :) ).